It’s that time of year again in which the sun moves away from the Earth, temperatures drop and darker days start moving in. For many of the world’s major religious traditions, these darker autumn and winter months become an impetus to connect with our own inner light sources: our spiritual sparks. This is often represented through the ritualistic lighting of little candles, or lamps. 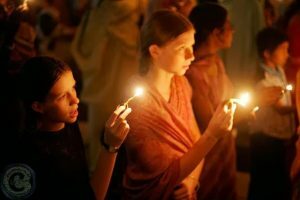 Beginning with this month’s Vaishnava offerings of ghee lamps for Damodar, to the flickering Diwali lamps, to the lighting of menorahs, we are entering a special time of year marked by people all over the world as a celebration of spiritual light. If we pay close enough attention, we’ll notice that our individual experiences of spiritual light and darkness increase and decrease with a rhythm that mimics the seasonal changes in nature around us. The yogis of the past—like Buddha and Patanjali—were incredibly attuned to this, and worked within these natural forces to support swift, spiritual development. Long, dark nights of the soul—to borrow a phrase from John of the Cross—have an amazing ability to cause us to reach toward divine light with the most fervor, like Arjuna did at the beginning of the Gita. As such, autumn is meant to prepare us for a spiritual hibernation of sorts, in which we take inventory of all those places and people that we find the most spiritually nourishing in our lives, and keep them very close to us. In this context, darkness paradoxically becomes a servant of the light, fueling its brightness. 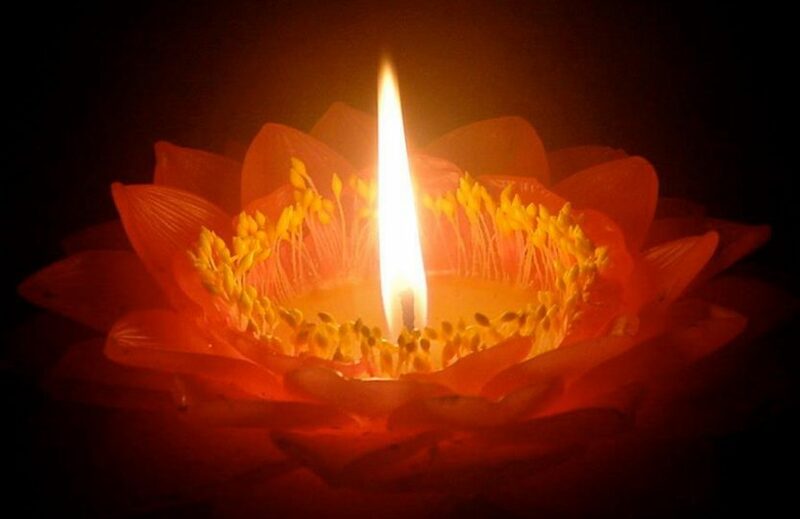 After all, the light of a candle shines the brightest in a dark room. The brightest light in the Bhakti tradition is the supreme Goddess, Radha: Krishna’s dearest beloved. Radha and the Gopis—her cowherd girlfriends—spend the entire autumn season in the forests of Vraja, playing with Krishna, in what is called the Rasa Lila. During the Rasa Lila, the Gopis express the sweet sentiments of devotional love that are at the very heart of the Bhakti tradition. Today, we find these beautiful, poetic words in the tenth book of the Bhagavat Purana: the ancient Sanskrit text so dear to practitioners of Bhakti. This month, devotees of Radha and Krishna, meditate on the stories of the Bhagavat Purana that describe Krishna as an adorable toddler: Damodar. In one of the stories, Krishna’s mother, Yashoda, binds him up with her love—represented by ropes. Baby Krishna eventually frees himself of these ropes and crawls off. But Krishna never frees himself of the “ropes” of Radha’s love. Radha’s love has more power over Krishna than anything else. During the month of Kartika, we especially celebrate and serve this love. In fact, the special spiritual power, or shakti, that flows forth to us this month mercifully comes to us from Radha: for she grants us direct access to him. For this reason, Radha is called Urjesvari: the empress of all power. Her love is so powerful, in fact, that the Bhakti tradition describes it as stopping the sun and the moon in their orbits. It is said that during this whole month of Kartika the moon remained full—its bright light shining upon Radha Krishna and the Gopis during the Rasa Lila. Kartika begins with the last full moon (sharad purnima), and lasts until the next (rasa yatra purnima). We light the candles every morning and evening this time of year to remind us that our spiritual enthusiasm has the potential of never waning, just like the full moon of autumn during the Rasa Lila. The external lights are a beautiful reminder of the spiritual sparks we each have burning within us all the time. 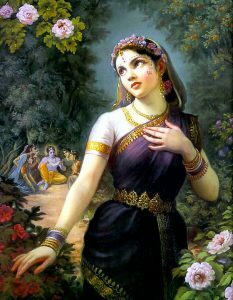 Kartika is considered the holiest month of the Bhakti tradition because—despite the darkness all around us—Radha’s love is always shinning brightly, and this is the month we feel it the most, as she shines her special mercy upon us.